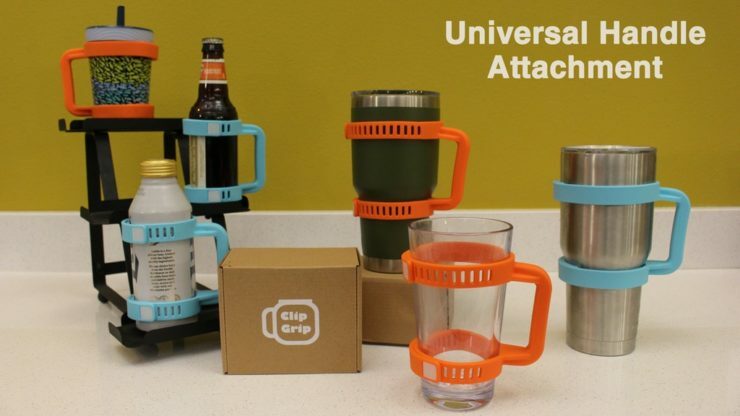 Clip Grip Gives You A Handle On Your Drinks | OhGizmo! By Randy Donack on 02/14/18 • Leave a comment! This is the Clip Grip. It’s a silicone handle that you can attach to your drinks for better control. Now you get all of the thrill of drinking out of a mug, without having to actually pour your Bud Light into one. Each set comes with 2 handles which can be adjusted via a silicone strap to fit just about any container. I mean, personally I like to drink everything out of a wine glass because I’m just that fancy, but it’ll fit just about anything else. Now, you might ask why someone would want to add a handle to a beer or a mason jar, but just think about all the times you could’ve gone ‘pinky-out’ if only you had a handle on your drink (and life). To be honest, adding a handle would make life a little easier for someone with arthritis, so I can’t really hate on this product. At the end of the day, we’re all human aren’t we? Available on KickStarter starting at $15 for a 2-pack.